Blackburn climbed out of the relegation zone after victory over Fulham which moved them up three places to 15th. After 90 seconds Fulham's Clint Dempsey burst on to Danny Murphy's header, outmuscled Ryan Nelson and poked home. Blackburn struck back when Chris Samba squared his header for El-Hadji Diouf to tap in unmarked on the back post. And with five minutes to go, Rovers secured a vital three points when Jason Roberts used his strength to turn Tony Kallio and shoot beyond Mark Schwarzer. Fulham got off to the best possible start after just a minute-and-a-half when a simple piece of route-one football caught the Rovers defence on the back foot. A long ball from Schwarzer was flicked on by Murphy and found Dempsey on the edge of the area where the American shrugged off the challenge of Blackburn skipper Nelson all too easily, before poking past the on-rushing Paul Robinson into the bottom right corner. Rovers looked shaken and the early alarm bells continued to ring. It was Dempsey who was again at the heart of Fulham's positive play when, as he ran towards the byeline, he inventively flicked a back heel to strike partner Andy Johnson who looked set to burst the net. But an exquisitely timed last-ditch challenge from Stephen Warnock kept the striker out. Fulham's forward line were proving too hot for Rovers defence to hold as Dempsey again pulled the strings to create another clear opening, flicking the ball to the edge of the area for the charging Simon Davies, whose rifled volley stung the palms of Robinson and was cleared from danger. Blackburn had to wait until the 17th minute for their first meaningful attack, but when it did come it was only a lick of paint that stopped Warnock levelling the game. The makeshift midfielder found himself in space on the edge of the Fulham area and curled a delightful left-footed effort around Schwarzer's outstretched palm, only to see it rattle off the inside of the post. That proved to be a rare first-half foray forward for Rovers, though, as Fulham continued to dominate. Zoltan Gera should have doubled the lead for the home side with a double effort, the first of which was a volley from six yards out that was saved point-blank by Robinson before Gera headed the rebound over the bar with the empty net at his mercy. A game that was by no means one for the football purists saw the ball spend more time in the west London night sky than it did on the poor Craven Cottage surface as long balls bombed from Schwarzer to Robinson and back again with little quality in between. 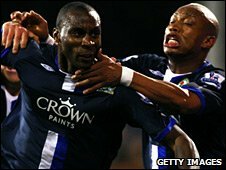 Blackburn boss Sam Allardyce brought Benni McCarthy on five minutes after half-time and that at last seemed to spark a Rovers revival. First a stunning half-volley from Warnock had all six feet five inches of Schwarzer sprawling to his left to finger tip an incredible save past the post. From the resulting corner Samba volleyed the ball narrowly wide from the edge of the six-yard box. Fuham were visibly rattled and Rovers, knowing a point would take them out of the Premier League relegation zone, looked ready to step up another gear and throw everything at the home side - and they duly did. Finally, a long ball was directed away from Fulham's giant centre-half Brede Hangeland. Tugay's looped header found Samba on the edge of the six-yard box, suspicions of offside ignored, and he centred for Diouf, who tapped in at the back post. Five minutes from time Blackburn's Roberts made sure Rovers took all three points back to Lancashire when he latched on to Morten Gamst Pedersen's hopeful ball, used his body to roll substitute Kallio and shoot low beyond Schwarzer. A fine last-minute save from Robinson to stop Erik Nevland's drive made sure of the points. "This was a big game from the player's point of view because nobody else was playing in the Premier League and this was our catch up game. "It has been a massive, massive three points and with nobody else playing it has shifted us up the league a bit. "It was certainly the biggest win since iv been here, the pressure the players are under and going a goal down so quickly it meant we had to show tremendous character and fight and spirit and as well as all that talent we have got we had that fight to come back and win. "The timing is good, lets strive to stay out of there now and stay in the position we are and if we can get a little further out of the bottom three." "I've got to say I thought Blackburn played with a lot of energy. We were struggling to match that energy. "There have been a lot of games for us recently and players are beginning to look tired. "They've played the long-ball game very well and forced us back. "I can't say they didn't deserve to win the game, I can't say that we did enough to win it. We lacked a bit of energy but the lads put up a brave performance. "We simply met a Blackburn team with more energy than us, more strength than us and as a result they were able to get the three points which were so vital for them. We'll just have to wait for ours." Fulham: Schwarzer, Pantsil, Hangeland, Hughes (Kallio 77), Konchesky, Davies (Nevland 90), Etuhu, Murphy, Gera (Kamara 80), Dempsey, Johnson. Blackburn: Robinson, Ooijer, Samba, Nelsen, Givet, Andrews (McCarthy 56), Kerimoglu (Mokoena 82), Warnock, Diouf, Roberts, Pedersen (Dunn 86). Subs Not Used: Bunn, Khizanishvili, Villanueva, Simpson. Booked: Diouf. Goals: Diouf 69, Roberts 85. BBC Sport Player Rater man of the match: Fulham's Mark Schwarzer with 8.38 (on 90 minutes).